I have such a soft spot for mini desserts. They’re just so cute! Plus, they’re great for entertaining and gifting. I also have an abiding love of Bundt cakes. Combine the two, and I’m positively giddy! These little beauties aren’t just adorable. No, they’re also rich, flavorful, and amazingly delicious. 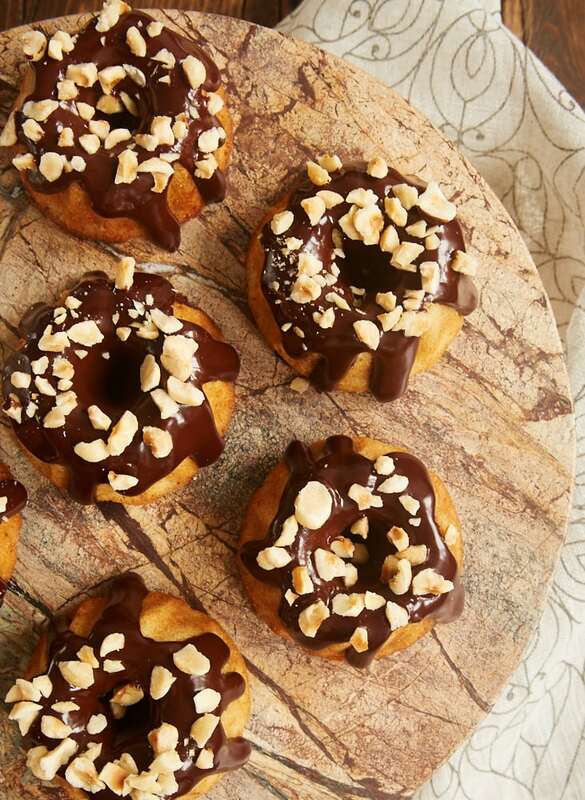 Toasted hazelnuts, browned butter, and a dark chocolate ganache combine wonderfully to make these cakes absolutely irresistible. This recipe features two of my favorite ways to boost flavor. First is browning butter. It’s such a simple process with such big results. It only takes a few minutes, but it would be worth it if it took much longer. The rich, nutty flavor is really quite amazing. Second on that list is toasting nuts. Like browning butter, it’s so worth the few extra minutes of effort to enhance the flavor of these cakes. For those of you who might need a refresher on how to toast nuts, spread them in a single layer on a lined, rimmed baking sheet. Then bake at 350°F for about 10 minutes. Be sure to cool them before you add them to the batter. Topping off these cakes is a dark chocolate ganache. Usually, I make ganache by heating cream in a saucepan on the stovetop just until it starts to bubble. Then it gets poured over chocolate and stirred after a few minutes. 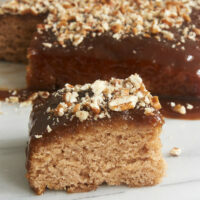 For recipes like these where you need a smaller amount of ganache, I find that the microwave works just fine. Just heat, wait a few minutes, and stir. So easy, right? To make these mini Bundt cakes, you’ll need a mini Bundt cake pan. Look for one with a 1-cup capacity for each cavity. I’ve had mine for a while, and I use it at least a few times a year. 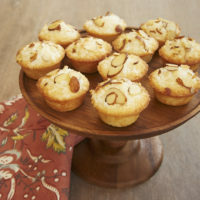 If you don’t want to fit another pan into your kitchen storage, you can make cupcakes instead. 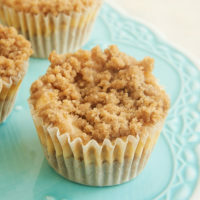 Just use a standard-size muffin pan. The baking time shouldn’t vary much if at all. We really love everything about these cakes, from their flavor to their appearance and everything in between. 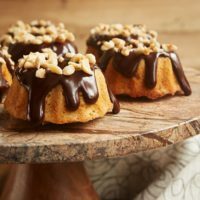 If you’re looking for mini desserts with maximum flavor, then these Brown Butter Hazelnut Bundt Cakes are just the thing! 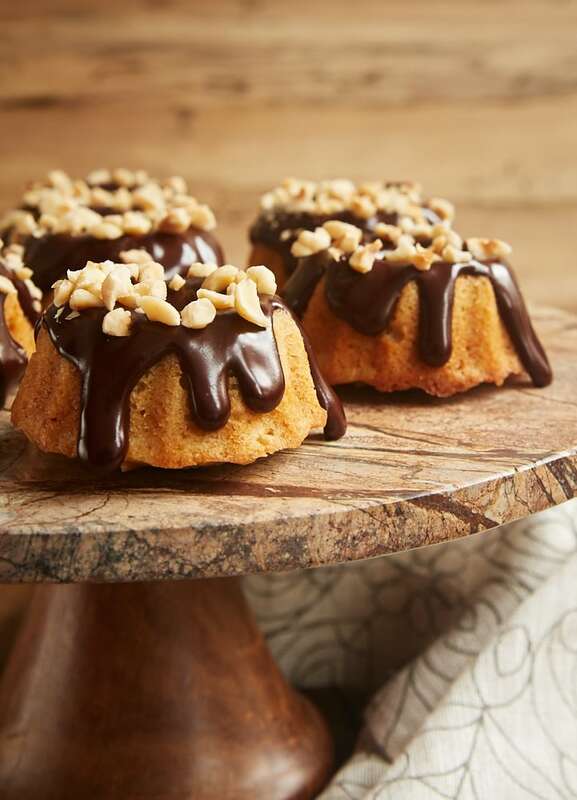 Brown Butter Hazelnut Bundt Cakes are little treats with big flavor. 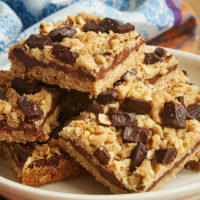 Toasted hazelnuts, browned butter, and dark chocolate ganache combine for an irresistibly delicious dessert! Transfer the butter (including the browned bits) to a large mixing bowl, and allow it to cool for about 10 minutes. Add the sugar and brown sugar to the cooled butter. Use an electric mixer on medium speed to beat until thoroughly combined. Add the eggs, one at a time, mixing well after each addition. Mix in the vanilla. Reduce mixer speed to low. Add the flour mixture in three portions, alternating with the milk. Mix just until combined. Stir in the hazelnuts. Divide the batter among the prepared pans, using about 3 tablespoons of batter to fill each cup about 3/4 full. Bake 18 to 22 minutes, or until a pick inserted into the center comes out clean. Place the chocolate and cream in a microwave-safe bowl. Heat in the microwave for 1 minute. Let the mixture sit for 5 minutes. Then, stir or whisk until smooth. 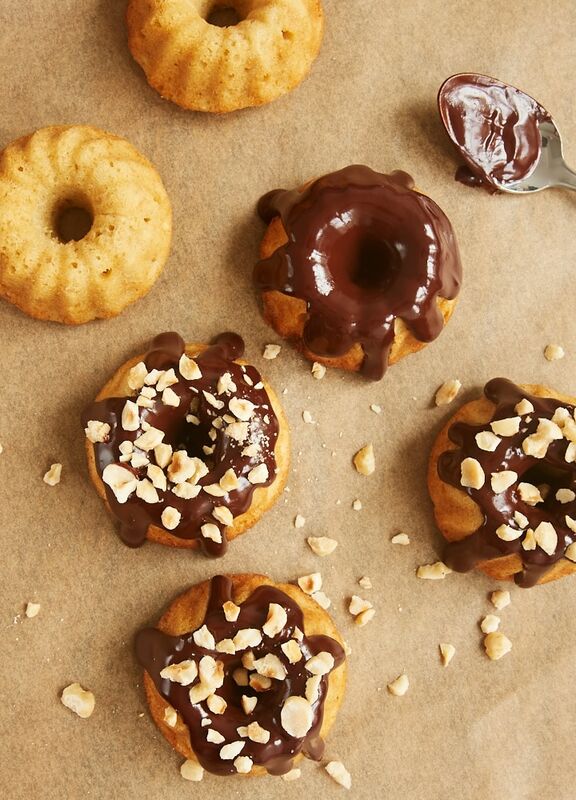 Spoon the ganache over the cakes. Sprinkle with reserved chopped hazelnuts. *If you don’t have multiple pans, you can bake one batch at a time, allowing the pan to cool before prepping and filling it again. Keep the batter refrigerated between batches. This looks wonderful! 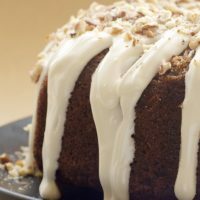 Could you use this same recipe to make one regular size bundt cake? Hi, Melanie. You can, but it will take a large Bundt pan (maybe 14-15 cup capacity). The baking time will need to increase, as well. I’d guess it would need to bake about an hour. 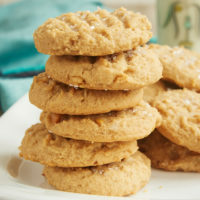 You had me at brown butter! These are so cute. yummy! i will make this delicious food. Thanks for sharing your recipe. This looks so yummy! 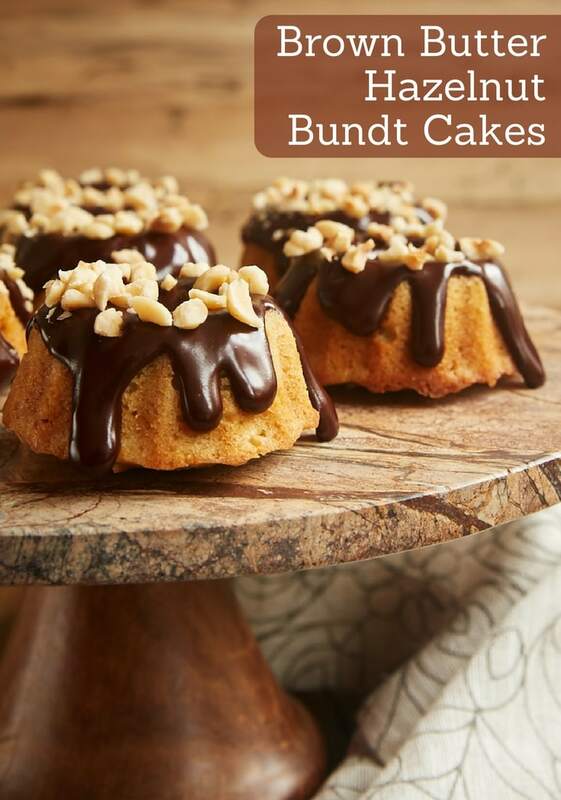 Just bought a 12 cup mini bundt pan – this is a must try!